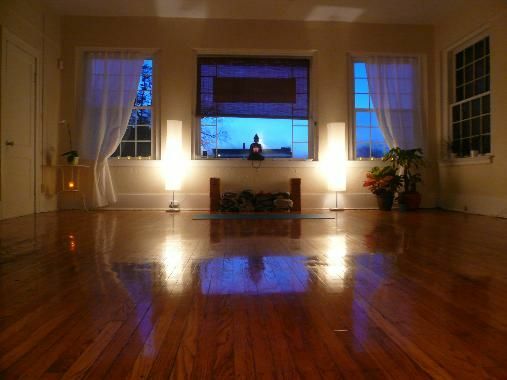 Heading to an actual yoga class at a local studio can be expensive and time-consuming. Many yogis would prefer to continue their practice more conveniently from the comfort of their own home. Designing an in-home yoga studio is a dream come true for most avid yogis, but they can easily become overwhelmed by all of the options. Should it look more traditional or sleek and contemporary? When you create a home yoga studio, things don’t have to be complicated. 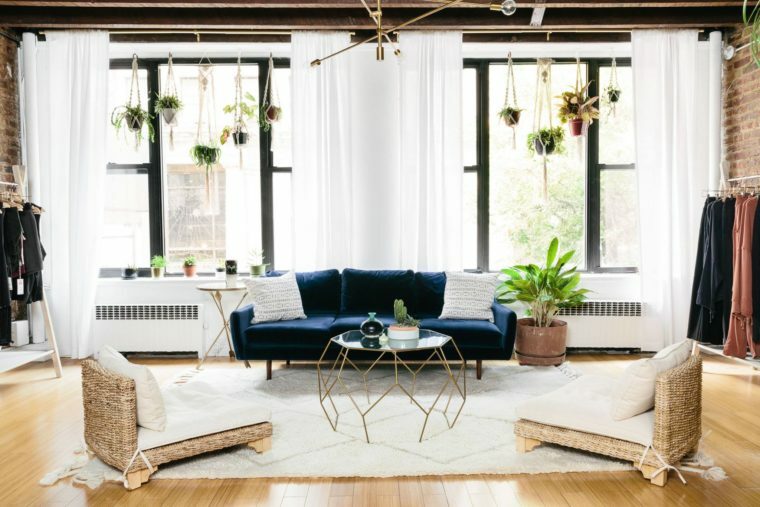 You can take a look at these simple suggestions to help you start designing the perfect space today. 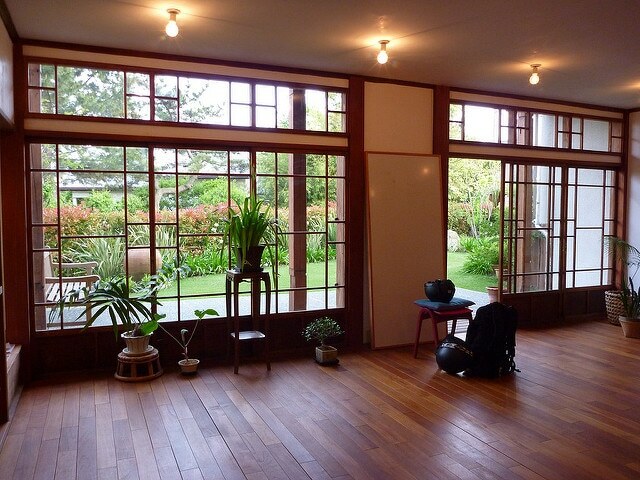 The reason so many people love the yoga studio is that it’s quiet, apart from the sound of the class. In a normal home setting, it can be difficult to find a quiet space to practice unless you have a detached building like a shed or a garage. Instead, you will have to find creative ways to soundproof your yoga space. Adding a white noise machine or a soundtrack that plays waterfall sounds could be a good solution for blocking out noise in the rest of the house. No one wants to practice yoga under the bright fluorescent lights that light up every nook and cranny. These lights may be essential to your other activities throughout the day, but you can abandon them when it’s time for your yoga practice. Opt for soft lights and accent lights that can set the stage for total relaxation instead. Everyone has different preferences when it comes to what’s comfortable for them. Most yogis wouldn’t argue about having some oversized floor pillows or a very soft blanket at their fingertips during a practice. Add items around your yoga mat and practice area that make you feel instantly at home, comforted, and ready to practice. Sometimes, the act of rolling out the yoga mat is the most difficult part of starting your practice. If you have a home yoga space, you should try leaving your yoga mat out all the time. This takes some of the hassle out of setting up your space day after day. It’s a constant visual reminder that your time on the yoga mat is important and should be prioritized in your life. With your yoga mat rolled out and ready, you’re far more likely to sit down for a few minutes of meditation or a gentle practice, even on your worst day. 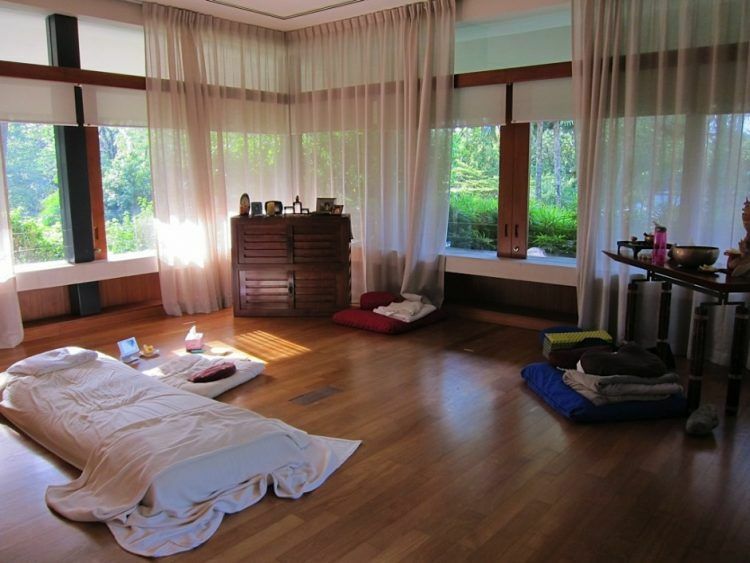 Creating a home yoga space doesn’t have to be difficult or require elaborate settings. You can make the most of the simple tools at your disposal with these four creative suggestions for creating a lovely space where you can move further into your yoga practice. Save time and money while you become a more grounded yogi by creating a comfortable home space where you’ll enjoy practicing day after day. The word chakra is literally translated as “wheel” in Sanskrit. This name represents the spinning subtle energy sources in our system that counteracts the physical aspects of our body. The seven chakras that mainly affect our being started from the material-based self at the base of our spine, all the way up to our higher-vibration spiritual being in our crown. The root, sacral, navel, heart, throat, third eye and crown chakra are placed in alignment with the spine. 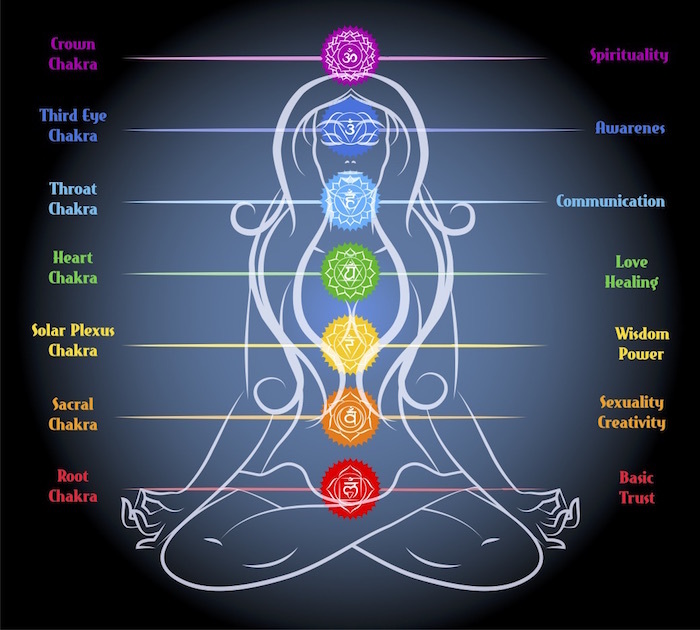 Every chakra provides energy to a certain body organ that it is connected to. In addition, the physical body has its counterpart in our spiritual being, meaning the impact of each chakra manifests both in the physical and spiritual plane. Chakras differ from person to person and its activities and manifestations depend on an individual’s awareness of Self. Unbalanced chakras can make a person vulnerable. Being open to the flow of life in these chakras empowers awareness and allows balance to our mental, physical and spiritual Self. The practice of Yoga aims to purify low-frequency energies through meditation and the humbling physical practice to create a space for awareness within. Here are the seven chakras in our body and how they manifest. Being conscious of each one will help elevate awareness and transform lower vibrations to higher consciousness. 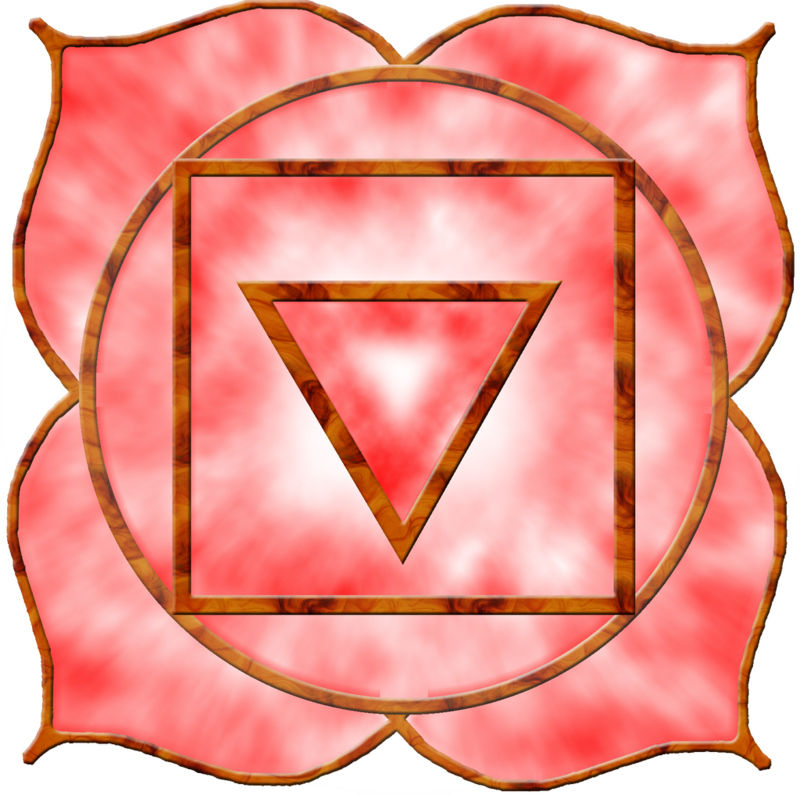 This chakra is located at the base of the spine and is represented by a red lotus with four petals. Root Chakra is the seat of our humanistic nature to survive. It is the fundamental space that embraces our instinct to be self-sufficient and physically stable. Muladhara is related to our suprarenal glands, bladder, kidney, and spine. If unbalanced: If the Root Chakra is too open, an individual shows over possessiveness and fear. A person with too closed of a Root Chakra often plays the victim, is ungrounded and homeless. Located between the pubic bone and the belly button and symbolized as an orange lotus with six petals. Sacral Chakra plays a vital role in relationships. It represents creativity, emotions, pleasure, and sexuality. To master awareness of this chakra means to introspect your Self and be conscious of others’ egos. A firm belief in one’s sexuality and being sensual with emotions are signs of a well-balanced Swadhishtana. This chakra is related to the reproductive system. If unbalanced: Too open of a Sacral Chakra can cause sexual addiction and manipulations. A person with too closed of a Sacral Chakra is co-dependent and submissive. This chakra is located at the solar plexus and is represented by a yellow lotus with ten petals. It is the seat of our self-esteem, individuality, and willpower. A well-balanced Manipura is shown through a firm sense of purpose, motivation, and confidence. Manipura is also related to stomach, gallbladder, pancreas, and liver. If unbalanced: An egomaniacal sense of Self is a sign that the Navel Chakra is too open and a low sense of self-worth means that Manipura is closed. Located at the chest and is represented by a green lotus with twelve petals. Anahata our body’s seat for compassion and unconditional love. It serves as a channel that connects our low-frequency Self to higher vibrations where our true nature is free. This chakra is related to thymus, lungs, heart, and liver. A well-balanced Heart Chakra is represented by a healthy immune system, heart and a good flow of blood in the body. If unbalanced: Poor emotional expression is a sign that this chakra is too open and being ruthless means that Anahata is closed. Located at the throat and is represented by a blue lotus with sixteen petals. It relates to our self-expression through creativity and communication. Vishuddha is the source of intuition and diplomacy and is connected to our upper lungs, thyroid gland, digestive tract, and throat. A well-balanced Throat Chakra is shown through creative communication, both written and spoken. If unbalanced: Being judgmental with an unstoppable mouth is a sign that Vishudda and being silent, shy and closed means deficiency. Located between the brows and is represented by an indigo lotus with two petals. This chakra is directly related to intuition. This includes higher mental activities such as psychic abilities and spiritual awakening. Anja is also the energy that promotes compassion and forgiveness. This chakra is related to the pituitary gland, lower brain, nose, spine, ears, and left eye. A well balanced Third-Eye Chakra is recognized if a person has an ultra-sensitive intuition. And since the pineal gland is responsible for producing melatonin, which is needed for good sleep, a healthy Anja means that the body, mind, and spirit is given the rest it needs. If unbalanced: When the Third-Eye Chakra is too open, a person can be too analytical and tend to jump to conclusions. A closed Anja can cause confusion and a fogged mind. This chakra is located at the top of the head. The word Sahasrara means a thousand petals and is represented by the color white or violet. The Crown Chakra is related to enlightenment and is considered our spirit’s connective center. It creates a deeper sense of devotion, spiritual understanding and selflessness. This chakra is related to the pineal gland, right eye, and the upper brain. A person with a well-balanced Sahasrara is highly aware, both of the physical and emotional happenings. It also likely that enlightenment was reached and the Self is unified with the divine source. If unbalanced: Too open of a Third-Eye Chakra can lead to psychosis and egomaniacal mentality. If this chakra is closed or blocked, one may lack aspiration and spirituality. Each chakra plays a vital role in developing an individual’s over-all understanding of Self and the universe. Starting from the basic physical-based lower frequency Self and slowly transcending to a higher conscious Self is not an easy journey. But with the proper approach and guidance, nothing is impossible! As long as the spirit is shrouded with strong willpower and discipline, your journey to unmask your real existence will surely progress. You might have already heard about the Sanskrit word Chakra that translates directly into” wheel”; and from the yoga perspective it makes reference to a wheel or disk of energy where matter and consciousness merge. This energy is also called Prana, a term that stands for vital force or cosmic force and according to Hinduism philosophy it is a vitality that impregnates everything, even inanimate objects. We all have seven principal chakras that begin at the base of our spine and proceed all the way up to the crown of our heads, but the one on which we will be dedicating our attention to in this article will be the first one: Muladhara. Muladhara is found at the base of the spine, encompassing the first three vertebrates, the bladder and the colon and as expected the two Sanskrit words that compose it mean “root” and “support”. Being one of the three chakras of matter, this one embodies our sense of stability and safety in our lives. Basic survival needs such as water, food, shelter, and safety are intrinsically connected to this chakra. When this one is aligned we feel calm and secure despite whatever may be happening around us; if there is an imbalance or blockage in this chakra, however, we will be haunted by fear and mistrust even when external situations do not directly call for these feelings. Some of the expressions of a Muladhara chakra that is imbalanced may be recurrent nightmares, thoughts of fear, or eating and anxiety disorders. Whereas physical symptoms might appear as bladder, colon, or intestine problems and lower back, leg, or feet discomfort or issues. Meditation is definitely recommended for opening and bringing a chakra back to balance. In this case, by learning how to re-connect with your inner Self and the cosmic Self through the practice of quietness, stillness, and concentration you will gradually get closer to the undoubtable truth that affirms how real safety will always come from within and will never come from outside of The Self. The more you experience this unbreakable refuge and sanctuary that lies within you, by silently sitting alone in meditation position, the more this peaceful state of being will be able to accompany you throughout your daily life. Nobody likes to diet. In fact, most experts seem to suggest that most diets are too restrictive to be useful for a normal person. The key to weight loss seems to be sensible eating, cutting down on simple sugars, and getting regular exercise. However, even doing that much can be difficult. When it’s late in the afternoon and you’re starving, a chocolate bar can look much more interesting than a carrot stick. This is where willpower comes in. Unfortunately, your levels of willpower fluctuate through the day, often running out just when you need it the most. Here are several tips for saving and boosting your willpower so that you don’t end up eating fast food in a weak moment. Willpower is the ability to pursue long term goals over an extended period. Whether that means saying no to junk food, exercising every day, or curbing your shopping, willpower is meant to help you long term. Unfortunately, the amount of willpower varies by person, and can be depleted by overuse, mental tiredness, or emotional instability. While this is a blow to your goals, willpower can also be increased or better directed so that it can be useful to you in the areas you need it most. One of the problems with setting goals is that we forget about them in the face of more immediate concerns. To achieve your goal, and use your willpower in pursuit of it, you need to focus on it. Write the goal down and look at it often, it will help you remember why you are changing parts of your life. It is a simple step, but one that is vitally important if you really want to achieve your goals. Habits are easy to perform. Every day we get up and brush our teeth. It takes no willpower or thought, most people just do it. Because most of our behaviors are habits, they don’t deplete our store of willpower. If you want to exercise, meditate, or some other regular behavior, then work on making it a habit. Do it at the same time every day set up cues around you that prompt you to perform the behavior. One such cue might be setting your workout clothes out every night before bed, so that you see them as soon as you get up. Once the target behavior is a habit, you won’t have to use up any of your willpower to make yourself do it. Your brain is a muscle that gets tired. Make sure it gets a good mix of nutrients and vitamins so that it works at its peak efficiency. There will be times when you fail, you will forget to exercise, or you’ll eat chocolate, or break your promises to yourself. Don’t use these slips as an excuse to stop the behavior completely, and don’t beat yourself up. Accept that failure is human and move back into your healthier behaviors again. Because willpower is often used to ignore a short-term goal in favor of a long-term goal, it’s important that you give yourself small rewards to compensate. This does not include the food that you denied yourself in the first place. Set small goals that lead to the larger goal and reward yourself when you achieve them. People spend their lives trying to obtain the willpower to stay on their diet, exercise regularly, or to do things that work towards their goal. With these tips, they can increase their store of willpower and hopefully start achieving the aims they set for themselves. “I’ll sleep when I’m dead” is a popular saying that can potentially harm you in the long run. We have known for a long time that sleep is crucial for self-care and without it, a myriad of health issues can arise. Just like you make it a point to brush your teeth twice a day and exercise daily, making sure you get enough quality sleep needs to be a priority. Often, when we are busy and stressed, the one thing that seems to fall to the wayside is our sleeping habits. Unfortunately, sleep has adopted a stigma as more of a luxury than a necessity. The total opposite should happen in times of stress and as much as we would like to believe that more yoga, meditation and superfood smoothies will make us health goddesses, that is only part of the solution. Prolonged sleep deprivation has been scientifically proven to be just as dangerous as drunk driving and the health consequences are seriously eye-opening, no pun intended. Inconsistent quality sleep long-term can lead to an increased risk of stroke, obesity, heart disease and diabetes. Pretty scary stuff. Plus, how awful do you feel the next day after a restless night, not so great. So why does society paint the picture that in order to excel in all aspects of your life, rest needs to take a back seat? This is a false representation of what we should be striving for and can actually backfire, ultimately causing complete burnout. The root causes of why we are sleep deprived are numerous but here are a few of the more frequent offenders: anxiety, depression, clinical insomnia, stress, poor dietary habits and a combination of one or all of these. Experts have found that you may not realize you’re sleep deprived for a while, due to our reliance on caffeine or simply denial. The bottom line is that we all could improve our sleep habits one way or another. Who wouldn’t want to improve the quality of their life? Well, one way of doing that is by getting enough quality shut-eye. If you’re ready to take charge of your sleep and your life, here are a few tips that can help you get there. 1. Go to sleep at the same time every night, even on the weekends – Developing a consistent sleep schedule, one in which you go to bed and wake up around the same time is important for your circadian rhythm. For example, when you go to sleep every night at 10:00, your body prepares to start shutting down around that time because it knows you are about to turn in for the night. Same goes for waking up at the same time. 3. Don’t stress it – The worst thing you could possibly do during a night of tossing and turning is to stress out about not being able to fall and stay asleep. If you find yourself restless one night after trying to naturally fall back asleep, remove yourself from your bed and relocate to another room. Sit on the couch and read until you feel your eyes getting heavy. Counting sheep is not always the best solution. Sleep is an essential part of overall health and wellbeing. One third of our entire lives are spent sleeping and it is a time when the body recovers and rests. Without the proper amount and quality, we are harming our health in the long run. Try one of these tips tonight and counting sheep with be a thing of the past.